October - the past month has been a roller coaster with some depressing lows countered by a few highs. The most devastating low was the sudden death of Roger, a friend from our early teaching days. He was one of those rare individuals who managed to retain a level of educational realism and a sense of humour as he progressed through his career from classroom teacher to head teacher and finally to senior education officer. This event just confirms our belief that we should never expect life to be fair. Coming in the same month as the sad death of John Peel this has been a time for serious reflection on the important things in life not helped by Steve reaching the horrifying age of fifty-five. Australia is on the other side of the planet but with email and relatively cheap telephone rates we need to remind ourselves that we now live in a global village and it should be easy to maintain their friendship - all it takes is time to keep in touch. 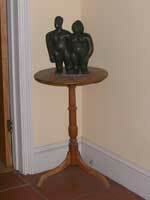 We've had several mails from them and they are settling into their new temporary home. 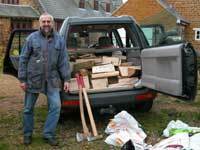 After several weekends of cutting the tree at Nether Heyford we were in the happy position of splitting the larger logs and loading the final pieces into the back of the Freelander. With the logs split they should season very quickly in readiness for next Autumn. Steve is never happier than when he is using the chain saw and splitting logs - it gives excellent aerobic exercise and great for building the arm muscles. At the moment we have enough logs to last this Winter and possibly into next year but a lot of them need cutting and splitting. A task usually carried out whilst Jane is out on her bike (she hates the noise). This is a bit of a cheat because we went to see Collateral in September but we forgot to include it. This was a really different film with Tom Cruise playing a hired killer - a little different from the "pretty boy hero" he normally portrays. All the action takes place overnight in Los Angeles and is the interaction between the hired killer and the taxi driver who he hires to drive him around while he kills the people on his hit list. Steve was interested because he was using a HP Tablet PC to keep details of the people he was contracted to kill - needless to say it didn't survive the car crash. Jane really enjoyed the movie and managed to stay awake through most of it. Steve had heard interesting reports about Layer Cake and persuaded Jane to go along even though it was a British gangster film. Jane thought it was OK if it had been a made for TV film but it wasn't worth watching on the big screen. Steve put it in the same genre as "The Long Good Friday". He enjoyed the conflicts and dilemmas the main character faced as he acted as middleman in the underworld drugs market. Jane's sister was over from Tasmania and so the family rented a bungalow in the Cotswolds between Broadway and Evesham. Such is people's odd perception of our lifestyle that when we told them we were going to Broadway they had visions of New York not Hereford & Worcester. The accommodation was comfortable and warm once we'd agreed to put the central heating on. 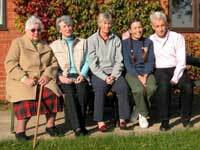 On the Monday lunchtime the whole family including Jane's cousins Robert and Elizabeth, and brother Richard who had taken a lunch time out of his busy schedule, went out for lunch which was very enjoyable. As Robert is a Tory councillor on Barnet council and Frank is an ex labour councillor politics was not on the menu. We (Jane, Steve, Ruth and Jo) planned a walk one morning based on the forecast of sunshine in the morning and rain in the afternoon. It turned out quite the reverse and we got soaked through. Thankfully part way round the walk there was a very convenient pub which served hot chocolate and had a huge inglenook with logs burning away - heaven. 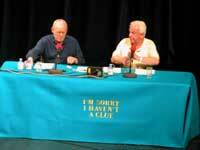 One of Steve's minor ambitions was to see BBC Radio 4's "I'm Sorry I Haven't a Clue" chaired by Humphrey Littleton. This is a non quiz show that consists of silly games with hilarious dialogue and jokes. One of the most famous rounds is called Mornington Crescent and is supposed to be played between London underground stations so that each person tries to work their way towards Mornington Crescent and the first person to arrive wins. As a game it loses a lot in translation. They record two thirty minute shows in one evening. After 90 minutes they had recorded enough material for the first show and there was a break. We were worn out with laughing but the second half maintained the laughter levels. To get to see it recorded we had to travel to Hull and in a moment of madness we decided to stay overnight in a Campanile hotel, more like a motel. Jane told our college friends, John & Susie, that we were going so they also got tickets and we had a minor reunion. Neither of us had been to Hull before and we didn't know what to expect. As an old port there is, unsurprisingly, a lot of emphasis on the sea and trading. 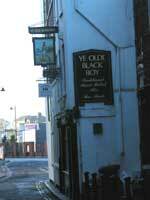 Part of that trade was in slaves hence the name of this pub - not politically correct but history wasn't PC. How long before someone insists they change the name? The Saturday evening had been extremely wet but the Sunday morning was bright sunshine and set Hull in the best light possible. We strolled the back lanes with John and Susie, had breakfast at "The Deep" marine centre before heading back to the motel to pick up our cars, say our farewells and head off to our respective homes. The experience incited Jane to contact the BBC and get tickets for the Radio 4 programme "Just a Minute" which is her favourite - it must be the suave sophistication of Nicholas Parsons that is the incentive.